Fabulous men's Christmas carolers bringing jazzy, swingin' versions of holiday classics to your event. "Caroling a la Carte™," contemporary & traditional holiday favorites with effortless booking & astonishing musicality. 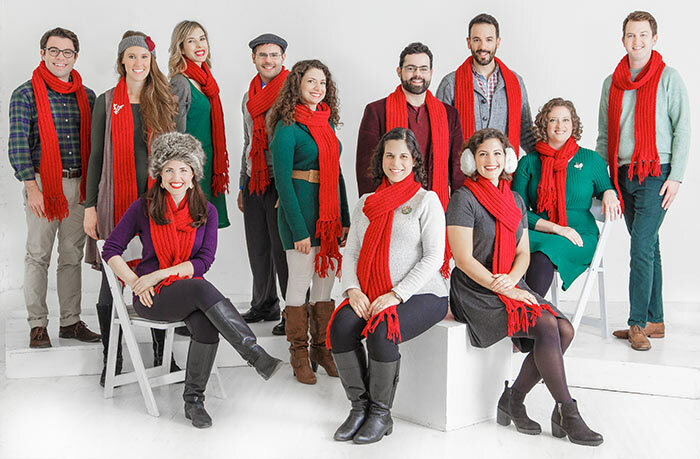 Holiday heart & soul — modern, cosmopolitan women's holiday acappella with a classic twist. Three charming & unique holiday vocal groups. One effortless way to add some fa-la-la to your season's events. We are NYC's best, most popular contemporary carolers. We are New York Holiday Singers, Inc. The holidays are the most wonderful time in the New York City area. From the lights, sounds & sights of the City, to the decorations and community of hollows, towns and villages nearby, one can truly experience the holidays and their traditions in every way imaginable. And above all this bustle, you hear: the music. No other time of year has inspired and captured the imagination of songwriters and performers than winter and the Christmas season. No other season lends itself to music that can connect people, often strangers, with one another. Hearing carolers on a street corner, or singing together with family & friends, or any other number of memories we’ll cherish are a shared experience that can lay the soundtrack for the season. Go beyond basic Christmas carolers. That’s why we started New York Holiday Singers, Inc.
Husband-and-wife team Greg Kefalas and Jen Arvay Kefalas formed New York Holiday Singers, Inc. in 2008, and since then we’ve been fortunate to grow to three fantastic groups with dozens of tremendously talented and kind singers. From the the industry-leading flexibilty and one-of-a-kind combo of jazz, classic carols, and secular favorites — including some traditional Christmas carols — of the New York Holiday Choristers, to the fun, disarming & charming guys of Men Singing Carols, to the newest addition to our company, the beautiful folk/blues trios of the Winter Graces, we’re proud to have grown into New York City's most popular contemporary carolers in our 11th holiday season. In a nutshell… The most polished & contemporary, premium holidays-only vocal ensemble you’ve ever heard. Caroling a la carte™ with fun music in a variety of styles & industry-leading flexible booking options. Charismatic, charming gentlemen singing Christmas carols & other songs, designed to charm & delight. Elegantly casual women singing beautiful comforting versions of holiday favorites & new classics. Perfect for… Premium featured entertainment: Concerts, television/radio, opening for larger acts, upscale corporate & private events Our most versatile group! Background entertainment, private events, corporate holiday parties, restaurants, sing-alongs, “stroll & sing” Anywhere you want to add charm! Holiday luncheons & dinners, corporate & private events, Christmas parties Easygoing, relaxed & intimate events. Holiday teas & luncheons, private events, "stroll & sing"
Format & number of singers for events Minimum 1 hour. 5 Singers singing in 4-part harmony with vocal bassline, or 5-part harmony. Minimum 1 hour. 4-16 Choristers where available, singing in four-part mixed voices. Minimum 30 minutes in Manhattan, 1 hour outside. 3-7 Men where available, singing in three-part male voices. Minimum 30 minutes in Manhattan, 1 hour outside. 3-5 Graces where available, singing in three-part women's voices. Influences & comparisons The Manhattan Transfer, New York Voices, Swingle Singers, Singers Unlimited, The Real Group, etc. Way too many to list! The styles the Choristers sing vary widely across their massive repertoire. Straight No Chaser, Michael Bublé / Naturally 7, Harry Connick Jr., Billy Joel, Tony Bennett, and more. Sara Bareilles, Joni Mitchell, The Andrews Sisters, The Carpenters, Emmylou Harris/Alison Krauss, and more. Their "look" Classy & sharp. Formal (most common): Ladies in attractive cocktail dresses, men in tailored grey suits with natural shoulders. Casual: Modern holiday sartorial. Fun. Matching thick-knit red scarves. Fun, hip casual holiday attire, or a more formal look with jackets/ties (men) & dresses (women). Relaxed, but polished. Matching blue/grey/black striped scarves. Choose from preppy (sweaters, button-downs, blazers, and slacks) or a more formal option of jackets & ties. Elegant winter casual inspired by icy colors. 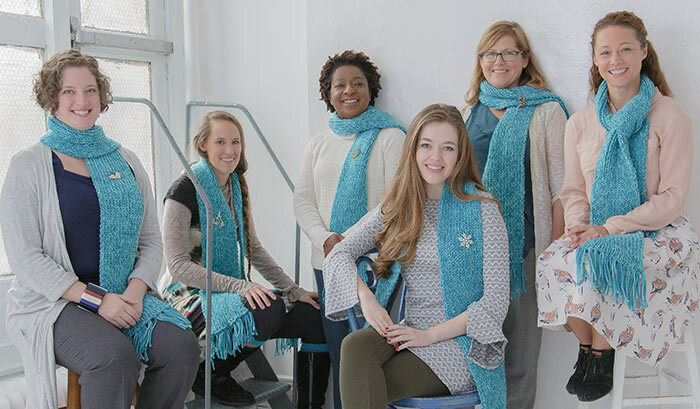 Matching, luxurious thick-knit teal/blue scarves. Seen & heard… Daniel, The Rachael Ray Show, WFUV Cityscape, WQXR, cabarets & concerts, and more. As the most popular contemporary carolers in the NYC/tri-state region… far, far too many to list! Fox 5 WNYW's Friday Night Live, SiriusXM's Pia Lindstrom Presents, Loews Regency Park Avenue, and more. We’re new in 2016, so stay tuned! Book them if you want… The cream of the crop. A true vocal jazz group, but focused on holiday music, performing a concert for your event. Elite musicality and unique, inventive versions of classics as well as original holiday songs. Ultimate flexibility coupled with the the largest songbook in the business, and a remarkably high level of musicality. Fun, charming men performing swinging and toe-tapping treatments of favorite carol & songs. Relaxed, easygoing three-part women's acapella with occasionaly high-energy favorites. Respected and recognized, musically & professionally. You've seen our company and our unique, highly-rehearsed music profiled on CBS Sunday Morning, you've seen and heard our groups featured & interviewed on The Rachael Ray Show, SiriusXM's Pia Lindstrom Presents, Fox 5 WNYW's Friday Night Live, NBC 4's New York Live, Fox & Friends, WFUV's Cityscape, and WQXR's The Arts File. We've proudly been hired to entertain as the official carolers for Loews Regency Park Avenue's Holiday Lobby two years running, as the carolers of Bank of America's Bryant Park Winter Village's Santa Parade since its inception, at The Friar's Club, The 21 Club, The Links Club, The Knickerbocker Club, Union Square's Holiday Market, at The Plaza Hotel, FAO Schwartz, The Terrace Club, the stunning Press Lounge in Hell's Kitchen, Hanley New York, One Penn Plaza, Plaza33, Normandie Court, One Lincoln Plaza, and dozens more. Our groups have been booked for corporate & marketing activations for Sony, Gap Inc., PayPal, Hearst/Town & Country Magazine, Joe Fresh, and many more. But, of course, we have sung for countless private events over the years as well, creating lasting memories for all guests, whether we're bringing our industry-leading music to your friends', coworkers' or family's private party, or leading groups in singalongs. Almost all of our groups' versions of holiday classics and contemporary favorites are custom-arranged by our musical director unique to each group, so unlike many other caroling companies, our professional ensembles' differences are deeper than just costumes. Each group has its own musical personality and songbook, and each group's members are permanent and finely-tuned, with no part-time or on-call "ringers" in sight. We require a high level of commitment from our performers, with months of weekly rehearsals to master our challenging music. 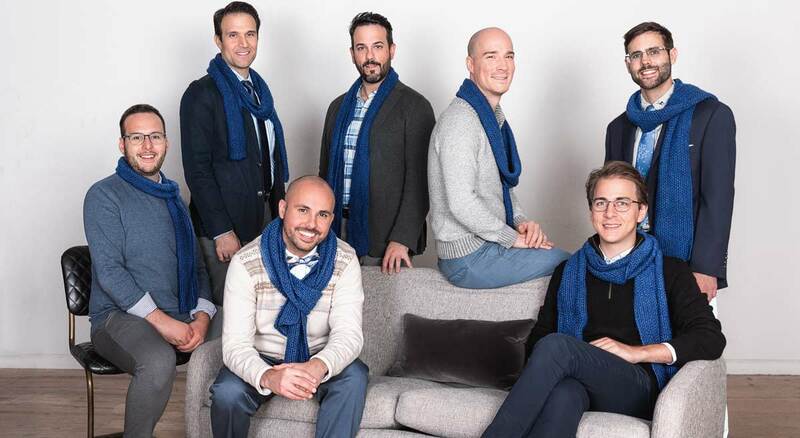 Our best-in-class music has been featured on WQXR, WFUV, and some selections have been published for performance by acapella groups and choirs all over the country. We also pride ourselves on our easy-to-work-with booking process and the industry-first efficiences we pioneered, including our custom online booking & event management system, online setlist editing where you can help select the songs we sings for your event, simple invoicing and online payment, and many more. For 11 years, it's been an uncompromising approach to providing the best holiday vocal entertainmennt possible. We'd love nothing more than to bring it to you and yours this holiday season! Interested in singing with one of our groups this year? The Choristers are seeking sopranos, tenors, and basses. Men Singing Carols are seeking tenors 2s. The Winter Graces are seeking sopranos. Auditions will be held on August 4th in Manhattan by appointment only. Callbacks will be held Aug. 5. To schedule an appointment, send pix and resumes to info@newyorkholidaysingers.com. Specify your voice part and which group interests you most. Submissions which do not note voice parts will not be considered. No video auditions will be accepted. Rehearsals begin in September in NYC.